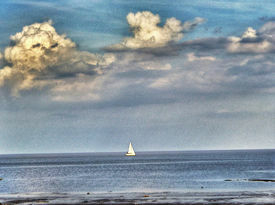 The Río de la Plata (Spanish: "Silver River") — which is often referred to in English-speaking countries as the River Plate, or sometimes as the La Plata River — is the estuary formed by the combination of the Uruguay River and the Paraná River. 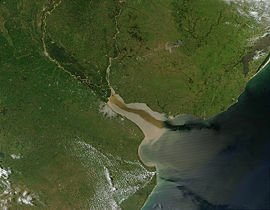 Broad, shallow, and muddy, it is a funnel-shaped inlet on the southeastern coastline of South America, extending 290 kilometers (180 mi) from the rivers' confluence to the Atlantic Ocean. Where the rivers join, it is 48 kilometers (30 mi) wide, and it runs to the southeast growing to 220 kilometers (137 mi) wide where it opens on the Atlantic Ocean, making it the widest estuary in the world. It forms part of the border between Argentina and Uruguay, with the major ports and capital cities of Buenos Aires in the southwest and Montevideo in the northeast. Martín García Island, off the coast of Uruguay, is under Argentine sovereignty. The basin drained by the main tributaries of the Río de la Plata (the Uruguay and Paraná, and the important Paraná tributary, the Paraguay) covers approximately one fifth of South America, including area in southeastern Bolivia, southern and central Brazil, the entire nation of Paraguay, most of Uruguay and northern Argentina. At 1.2 million square miles (3.1 million square kilometers), this hydrographical area serves as an important economic resource and the main fishing ground for the region. The English name "River Plate" is not a mistranslation, but in fact "plate" was used extensively as a noun for "silver" or "gold" from the twelfth century onwards, especially in Early Modern English  and the estuary has been known as the River Plate or Plate River in English since at least the time of Sir Francis Drake . A modern translation of the Spanish Río de la Plata is "Silver River," referring not to color but to the riches of the fabled Sierra del Plata thought to lie upstream. Although there is no evidence that any such mountain range of silver ever existed, the region around the Río de la Plata was indeed rich in silver mines. The closest mountain range that resembles the myth of the "mountain range of silver" is the silver mine of Potosí in modern Bolivia, a town known for its rich silver resources found on the town's mountain range. The climate in the northern basin area is generally hot and humid with rainy summers (October to March) and mostly dry winters (April to September). More than 80 percent of the annual rainfall occurs in summer with torrential downpours that are accompanied quite often by hail. The annual amount of precipitation is from 40 inches in the lowlands of the west to 80 inches in the eastern mountain region. The upper basin temperatures range from a minimum of about 37º to a maximum of 107º and an annual mean of 68º or above. The middle and lower basins are subtropical to temperate and maintain a 70 percent humidity level. Rainfall is somewhat less than that of the upper basin, however, it occurs throughout the whole year. 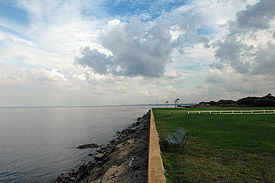 The mean rainfall along the entire Río de la Plata is 44 inches. The plant life within the vast Río de la Plata region is greatly diversified. To the east in the upper Paraná basin and higher elevations are forests with valuable evergreens such as the Paraná pine tree which is valued for softwood lumber. The western region is mainly grassland used for cattle grazing. In the flooded areas are plants that thrive in wetlands like the beautiful water hyacinth, Amazon water lily, trumpetwood, and guama. All along the rivers and streams are palms such as the muriti and the carandá and various species of quebracho trees valued as a source of tannin. In the Gran Chaco, the western region of Paraguay where the land is used mainly for cattle raising, are clusters of trees and bushes and herbaceous savannas, along with drought-tolerant thorny shrubs. Throughout eastern Paraguay are lapacho trees and the evergreen shrubs called llex paraguariensis whose leaves are used to make yerba maté, a stimulating tea-like beverage popular in many South American countries. 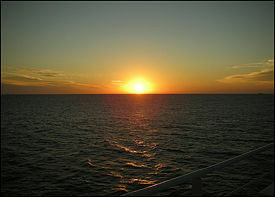 The Río de la Plata is a habitat for the rare La Plata Dolphin and various species of sea turtles (Caretta caretta, Chelonia mydas, and Dermochelys coriacea). The many species of fish include catfish, surubí, manduva, patí, pacu, corbina, pejerrey, meat-eating piranha, and the most prized species, the dorado, which resembles a salmon. There is also an abundance of reptiles throughout the region such as two caiman species, iguana lizards, rattlesnakes, water boas, yararás, frogs, toads, and freshwater crabs. The area is populated with numerous game birds, herons, and storks as well. The river's first sighting was in 1516 by Juan Díaz de Solís, a European Spanish seaman born in Lebrija, Seville who made the discovery of the river during his search for a passage between the Atlantic and the Pacific Oceans. He served as navigator on expeditions to the Yucatan in 1506 and Brazil in 1508 with Vicente Yáñez Pinzón. He became a pilot-major in 1512 following the death of Amerigo Vespucci. Two years after appointment to this office, Díaz de Solís prepared an expedition to explore the southern part of the new continent. His three ships and crew of 70 men sailed from Sanlucar de Barrameda on October 8, 1515. With two officers and seven men, he followed the eastern coast as far as the mouth of the Rio de la Plata, which he reached in 1516, sailing up river to the confluence of the Uruguay and Paraná Rivers. The small party disembarked in what is today the Uruguayan Department of Colonia and were attacked by the natives (probably Guaraní although for a long time the deed was adjudicated to the Charrúas). Only one of them survived, a 14-year-old cabin boy named Francisco del Puerto, allegedly because the natives' culture prevented them from killing elderly people, women, and children. De Solís' brother-in-law, Francisco de Torres, took charge of the remaining ships and crew and returned to Spain. Years later, from a ship commanded by Sebastian Cabot, "a huge native making signals and yelling from the coast" was seen; when some of the crew disembarked, they found Francisco del Puerto, brought up as a Charrúa warrior. He went with the Spanish crew, eventually returning to Uruguay, after which there is no further record of his whereabouts. The area was visited by Francis Drake's fleet in early 1578, in the early stages of his circumnavigation. The first European colony was the city of Buenos Aires, founded by Pedro de Mendoza on February 2, 1536, abandoned, and re-established by Juan de Garay on June 11, 1580. The British invasions of the Río de la Plata were a series of unsuccessful British attempts to seize control of the Spanish colonies located around the La Plata Basin. The invasions took place between 1806 and 1807, as part of the Napoleonic Wars, when Spain was an ally of France. The invasions took place in two phases. A detachment from the British Army occupied Buenos Aires for 46 days in 1806 before being expelled. In 1807, a second force occupied Montevideo, following the Battle of Montevideo (1807), remaining for several months, while a third force made a second attempt to take Buenos Aires. After several days of street fighting against the local militia in which half the British forces in Buenos Aires were killed or wounded, the British were forced to withdraw. The resistance of the local people and their active participation in the defense, with no support from the Spanish Kingdom, were important steps toward the May Revolution in 1810, and the Argentine Declaration of Independence in 1816. An early World War II naval engagement between the German "pocket battleship" (heavy cruiser) Admiral Graf Spee and British ships, the Battle of the River Plate, started several miles off the coast of the estuary. The German ship retired up the estuary and put into port. A few days later, rather than fight, she was scuttled in the estuary. Once roaming the Alto Paraná and Paraguay rivers and throughout the Pantanal were the nomadic hunter-gatherers, the Bororo and Guayacurú. Farther south the Guaraní established more permanent villages where they raised crops such as maize (corn) and manioc (cassava), which are still main staples in the region today. The Gran Chaco of western Paraguay and the Pampas of Argentina was home to the nomadic Lengua and Abipón. Due mainly to the extensive wartime loss of Paraguay's male population, the Spaniards and Portuguese interbred with the indigenous women creating a population of mostly mestizos. Unlike most other countries, the Guaraní language is still spoken by 90 percent of the population of Paraguay in conjunction with Spanish. In Brazil, however, many of the indigenous tribes have remained intact and somewhat isolated. Other groups such as the Boror, Bacairi, and Tereno have adopted Brazilian culture and even some Christian traditions. There are also a significant number of descendants of German and Japanese immigrants living in the Alto Paraná region of Brazil. Today the majority of the population in the Río de la Plata region lives in Buenos Aires, Argentina, and Montevideo, Uruguay, and is mainly of European descent. Rioplatense Spanish or River Plate Spanish (in Spanish, castellano rioplatense) is a regional form of the Spanish language which is mainly spoken in the areas in and around the Río de la Plata basin, in Argentina and Uruguay. The adoption of the Spanish language in the area was due to Spanish colonization in the region. Many non-Spanish speakers confuse Rioplatense Spanish with Italian because of the similarity of its cadence. However, native Spanish speakers are able to understand it as another form of standard Spanish, as different from Peninsular Spanish as Mexican or Caribbean Spanish. Until immigration to the region, the language of the Río de la Plata had virtually no influence of other languages and varied mainly by the means of localisms. Argentina, much like the United States and Canada, though, is mostly comprised of immigrant populations, the largest being of Italian descent. 1870–1890: mainly Spanish, Basque, Galician, and Northern Italian speakers and some from France, Germany, and other European countries. 1910–1945: again from Spain, Southern Italy, and in smaller numbers from across Europe; Jewish immigration, mainly from Russia and Poland from the 1910s until after World War II was also large. English-speakers, from Britain and Ireland, were not as great in numbers as the Italian, but were influential in the upper classes, industry, business, education, and agriculture. Indigenous languages in the area have largely been influenced, or even completely replaced, by Spanish since most Indian populations were expunged when the Spanish arrived in Argentina. However, some Indian words have entered into the Spanish of the region, with a few having been adopted into English. 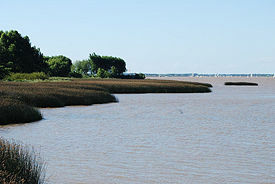 A treaty between Argentina and Uruguay was established in 1973 to manage the binational estuary. On the Uruguayan side, some limited management has developed with financial and technical assistance of Canada’s International Development Research Centre (IDRC). Their goal for this area is to improve environmental conditions while promoting the sustainable use of coastal resources. This experiment, referred to as ECOPLATA, calls for the combined efforts of national and local institutions. Some of the economic and ecological challenges rest with the fact that there are approximately 70 percent of Uruguay’s 3.3 million people living within 62 miles (100 km) of the coast. Unfortunately, human activities cause marine pollution and can accelerate beach and dune erosion. Mechanized agriculture and deforestation cause soil erosion, which then leads to sedimentation. Coastal degradation is contributed to by inappropriate sand mining activities as well. With all these concerns combined with the rapid depletion of fisheries, it is not surprising that the deterioration of the ecosystem is affecting both local populations and the tourism industry. On the Argentine side, located on the western bank of the Río de la Plata estuary across from Uruguay, is the cosmopolitan gateway to South America, Buenos Aires. Its port is the largest in South America, handling 96 percent of the country’s container traffic. The cruise ship terminal Puerto Buenos Aires opened in 2001, contributing to the congestion. With its narrow channel from the port to the Atlantic Ocean, there is a need for constant dredging to keep the heavy traffic flowing. Cleaning the waterways remains one of the city’s most pressing problems. Just east of the port, however, there is an ecological reserve called Reserva Ecológica Constanera Sur. Built over a landfill sprawling with wetlands filled with foxtail pampas grass, there are over 500 species of birds and a few iguanas, thus making the area a paradise for birdwatchers and nature lovers alike. A major threat to the Río de la Plata’s estuary is the arrival of small mollusks from Asia and Africa carried in as larvae in the bilge water that ships take on in various ports to improve their stability. When the ship comes into shallow waters, like the Río de la Plata, the water is discharged, dumping the species into a new ecosystem. The adult species ride in on the ship’s hull, chains, or keel. The most harmful is the golden mussel, a freshwater bivalve native to the rivers and streams of China and Southeast Asia. With no natural predators, this new intruding species can displace native species, prevent normal development of marsh plants, and change the local ecological conditions. Solutions to these problems lie in a collaborative network for the research, development, and implementation of an integrated plan to preserve and develop the coastal resources and ecosystems. ↑ Oxford English Dictionary, 2nd edition, online version. ↑ Francis Pretty. 1577. Sir Francis Drake’s Famous Voyage Round the World; A Narrative by Francis Pretty, one of Drake's Gentlemen at Arms, Bartleby - Great Books Online. Retrieved May 21, 2007. Simionato, Claudia; Vera, Carolina; Siegismund, Frank. July 2005.Surface Wind Variability on Seasonal and Interannual Scales Over Río de la Plata Area. BioOne. Retrieved May 24, 2007. November 19, 1973. Treaty between Uruguay and Argentina concerning the Rio de la Plata and the Corresponding Maritime Boundary. United Nations. History of "Rio de la Plata"
This page was last modified on 13 July 2015, at 22:00.